When you purchase you will be sent a confirmation email with a file attached. Open that webpage attachment to be taken straight to the download page. I first heard of Mike Endicott when my son, David, fell off a mosque (don’t ask!) in Turkey, and broke his pelvis in three places. Because of the incredibly swirling complications that followed this accident I was unable to get to a speaking engagement in Gloucestershire, and Mike very kindly took my place.He turned a failed evening into a highly enjoyable experience for all those who were there. It was great for me as well, because, as an indirect result, I had a chance to read this book in manuscript form. I get to read a lot of books in manuscript form and I can tell you that the experience is not always a pleasant or edifying one. This time it was pure pleasure. 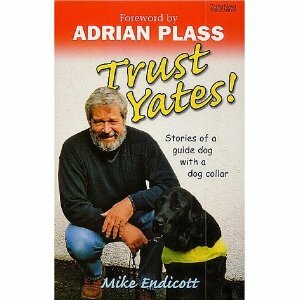 I challenge you, as you read this book, not to fall in love with Yates, his owner and the master that Mike serves. Jesus was a superb storyteller, and the tradition is carried on by this writer. With warmth, wit and wisdom he uses a succession of charming tales to seamlessly educate and re-educate us in the endless revelation of God’s love. The laughter and lessons of the chapter entitled “Crumbs” will stay with me for a very long time.It was a real joy for me to spend time with Mike and his wonderful dog. I am confident that it will be an equally joyful experience for you. 4 part audio series from Revd Mike Endicott. Four talks on the kingdom, recorded in Mike’s office, and how to get nearer and nearer.